Click on Go To Date and select the date of your event. You will see the available Library spaces. Click on the time you would like to reserve the room, including set-up time. 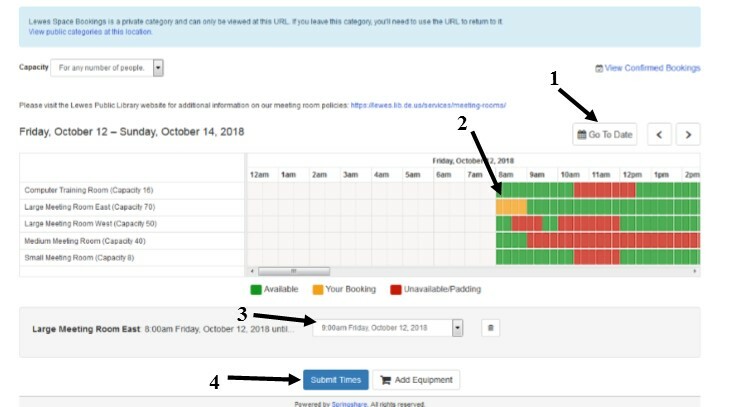 If you are booking more than one room, for example both the East and West Sides, select times for both. In the drop-down menu that appears below, select the end time, including break-down time. Click on Submit Times and complete the form. You will receive a confirmation and invoice once your reservation request has been reviewed.